How can hiccups in infants and babies be stopped? What are the signs symptoms of hiccups? When should I contact my doctor for hiccups? How is the cause of hiccups diagnosed? Which types of doctors treat hiccups? How can I stop, get rid of, and cure hiccups? Is there medical treatment for hiccups? Are there any complications of hiccups? A hiccup is a sudden, involuntary contraction (spasm) of the diaphragm muscle. When the muscle spasms, the vocal cords snap shut, producing the hiccup sound. Most cases of hiccups can be cured or resolve in a short time, and rarely are a medical emergency. See your doctor if hiccups last more than three hours, or if they disturb your eating or sleeping habits. Rarely, a doctor may prescribe medications such as chlorpromazine (Thorazine), haloperidol (Haldol), and metoclopramide (Reglan) for severe, persistent hiccups. Hiccups can be prevented by avoiding overeating, eating too quickly, or drinking too much to help prevent hiccups. Check out these 17 weird body quirks and their causes. Hiccups (also spelled hiccough) are sudden, involuntary contractions (spasms) of the diaphragm muscle. When the muscle spasms, the vocal cords snap shut, producing the hiccup sound. Hiccups are often rhythmic. They are usually just a temporary minor annoyance, but prolonged hiccups may signal a major medical problem. 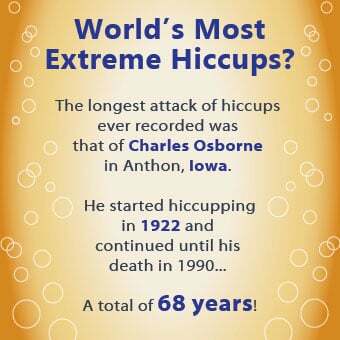 The longest recorded hiccup attack is six decades! Women and men tend to get hiccups equally as often, but hiccups that last more than 48 hours are more common in men. Hiccups can even occur in a fetus while still in utero. Most of the time, there is no obvious cause for hiccups. However, there are some common known causes of hiccups. Eating too quickly and swallowing air along with foods. Eating too much (fatty or spicy foods, in particular) or drinking too much (carbonated beverages or alcohol) can distend the stomach and irritate the diaphragm, which can cause hiccups. Any disease or disorder that irritates the nerves that control the diaphragm (such as liver disease, pneumonia, or other lung disorders). Abdominal surgery can also irritate the nerves that control the diaphragm, causing hiccups. Strokes or brain tumors involving the brain stem, and some chronic medical disorders (such as renal failure) have also been reported to cause hiccups. Noxious fumes can also trigger hiccups. As in adults, hiccups in newborns, infants, and babies are common and generally of no concern. If hiccups occur during feeding, stop feeding until the hiccups go away. Usually the hiccups will "go away" in an infant or baby. You may try changing the position of the infant or baby; try to get your baby to burp; or calming him/her down to cure the hiccups. Sometimes resuming feeding will stop the hiccups. If your baby frequently hiccups during feedings, feed your baby when he or she is already relaxed, and is not overly hungry yet. If your child's hiccups worsen or they seem to upset him, contact your pediatrician. Sudden, forceful movement of the diaphragm, that causes the hiccup sound, is the only symptom of hiccups. Most cases of hiccups resolve themselves in a short time, and rarely are a medical emergency. See your doctor if hiccups last more than three hours, or if they disturb your eating or sleeping habits. Seek medical attention if hiccups are associated with: abdominal pain, fever, shortness of breath, vomiting, coughing up blood, or feeling as if your throat is going to close up. Most of us know what a hiccup feels like and how to recognize it. In a medical setting, the diagnosis of hiccups is based on physical evaluation. Blood tests or X-rays are usually not necessary unless your hiccups are a symptom of an associated medical condition. Which specialties of doctors treat hiccups? 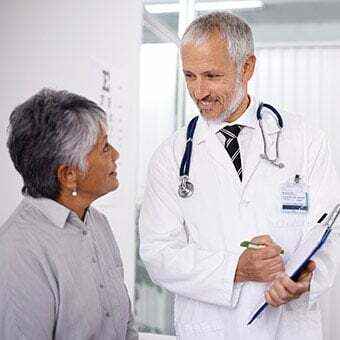 Hiccups generally go away on their own and do not require medical treatment, however, if hiccups last more than three hours or disturb eating or sleeping, you may see your primary care provider (PCP) such as a family practitioner, internist, or a child’s pediatrician. If the cause is a stroke or other neurological disorder, you may see a neurologist, a specialist in the nervous system and brain. If the cause is acid reflux, you may see a gastroenterologist, a specialist in disorders of the digestive system. If the cause is lung disease or pneumonia, you may see a pulmonologist, a specialist in disorders of the respiratory tract. Most hiccups will stop on their own. Home remedies are generally sufficient to resolve hiccuping. For persistent hiccups (lasting more than three hours), treatment varies, and you may need to contact your doctor. A health-care professional may prescribe medications for severe, chronic hiccups. Chlorpromazine (Thorazine) is usually the first-line medication prescribed for hiccups. Other medications used to treat hiccups include haloperidol (Haldol) and metoclopramide (Reglan). Some muscle relaxants, sedatives, analgesics, and even stimulants have also been reported to help alleviate hiccup symptoms. Phrenic nerve surgery (the nerve that controls the diaphragm) is a treatment of last resort. 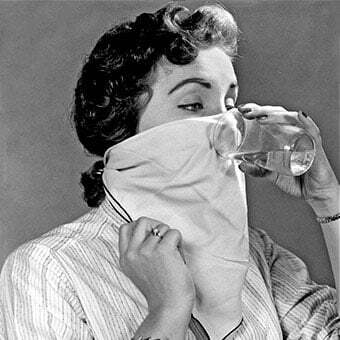 This treatment rarely is performed and is used only in individuals with hiccups that do not respond to other treatments. Because most cases of hiccups resolve themselves either spontaneously or with self-administered treatment, complications are extremely rare. In severe and persistent cases, where hiccups disturb eating and sleeping patterns, weight loss or sleep disturbances may occur. Rarely, cardiac arrhythmias and gastroesophageal reflux (GERD and GER) have been noted in severe cases of hiccups. Hiccups cannot always be prevented. Avoiding overeating, eating too quickly, or drinking too much can help prevent hiccups. Wilkes, G., et al. "Hiccups." Medscape. Dec 29, 2017. Wilkes, G., et al. "Hiccups Treatment and Management." Medscape. Dec 29, 2017. 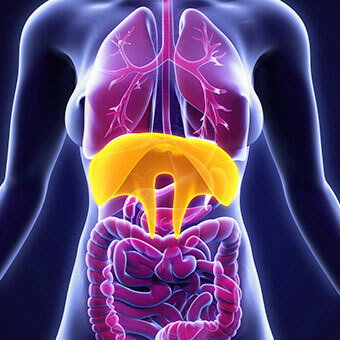 Treat your body right with these simple tips for the best digestive health from WebMD. See how to deal with diarrhea, gas, reflux, and more. Do you have other symptoms associated with hiccups? If so, what are they? Have you ever gone to a doctor or the ER for hiccups? Please share your experience. Everyone has a remedy for hiccups. What's yours? How long did you have hiccups? Stroke is a serious medical condition. If you think you or someone you know is having a stroke call 911 immediately. There are two main types of strokes, hemorrhagic and ischemic (the most common type). A hemorrhagic stroke occurs due to a blood vessel rupture in the brain. An ischemic stroke occurs when a blood clot becomes lodged in a blood vessel in the brain, which causes a loss of blood supply to the brain, possibly causing brain tissue death. FAST is an acronym that helps people identify stroke signs and symptoms so they can act fast and call 911. Face drooping, Arm weakness, and Speech difficulty are indicators that a person may be having a stroke and it is Time to seek emergency medical treatment. Additional signs and symptoms of stroke may include weakness, difficulty walking, blurred vision, dizziness, headache, confusion, difficulty speaking, and loss of sensation. Stroke is a major cause of death and disability in the U.S. Early identification and treatment of stroke helps reduce the risk of morbidity and mortality. Although a fever technically is any body temperature above the normal of 98.6 F (37 C), in practice, a person is usually not considered to have a significant fever until the temperature is above 100.4 F (38 C). Fever is part of the body's own disease-fighting arsenal; rising body temperatures apparently are capable of killing off many disease-producing organisms. Effective treatment is available for most patients with GERD. Learn about heart disease and heart attack symptoms and signs of a heart attack in men and women. Read about heart disease diagnostic tests, treatments, and prevention strategies. Heart attacks symptoms vary greatly for men and women, from anxiety and fatigue to nausea and sweating. Learn the warning signs of a heart attack and know the symptoms that may require an immediate trip to the hospital. Kidney disease is common. Take this kidney disease quiz to test your knowledge and learn the symptoms, causes and types of kidney disease and what foods to eat and avoid! Kidney failure can occur from an acute event or a chronic condition or disease. Prerenal kidney failure is caused by blood loss, dehydration, or medication. Some of the renal causes of kidney failure include sepsis, medications, rhabdomyolysis, multiple myeloma, and acute glomerulonephritis. Post renal causes of kidney failure include bladder obstruction, prostate problems, tumors, or kidney stones.Treatment options included diet, medications, or dialysis. The kidneys are a pair of organs located in the back of the abdomen. See a picture of the Kidneys and learn more about the health topic. Pneumonia is inflammation of the lungs caused by fungi, bacteria, or viruses. Symptoms and signs include cough, fever, shortness of breath, and chills. Antibiotics treat pneumonia, and the choice of the antibiotic depends upon the cause of the infection. Take the Stroke Quiz to learn about stroke risks, causes, treatment, and most importantly, prevention. A stroke or "brain attack" occurs when a blood clot or artery ruptures within the brain. The rupture or clot causes brain cell damage or death. A mini-stroke (TIA, transient ischemic attack) is caused by brain cells that dysfunctional over a short period. Stroke and mini-stroke warning signs of stroke and mini stroke are the same, and include, speech problems, weakness, numbness, and facial droop. Side effects of stroke may be permanent and you may never regain full function of the parts of the body affected. Mini-stroke side effects usually resolve within minutes to a couple of days. A transient ischemic attack (min-stroke) is a precursor for stroke because 40% of individuals who have a mini-stroke will have a stroke within a year. Treatment of stroke depends upon the type and parts of the body affected. When a portion of the brain loses blood supply, through a blood clot or embolus, a transient ischemic attack (TIA, mini-stroke) may occur. If the symptoms do not resolve, a stroke most likely has occurred. Symptoms of TIA include: confusion, weakness, lethargy, and loss of function to one side of the body. Risk factors for TIA include vascular disease, smoking, high blood pressure, high cholesterol, and diabetes. Treatment depends upon the severity of the TIA, and whether it resolves. Ice cream brain freeze, hiccups, charley horses, vertigo--what's behind these weird body quirks anyway? Our experts explain several odd body behaviors.